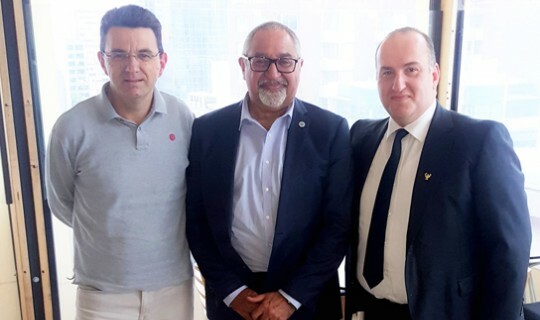 The Victorian Commissioner for Aboriginal Children and Young People, Mr. Andrew Jackomos, who has both Aboriginal and Greek ancestry, visited the Greek Community of Melbourne, on Tuesday 31October and met with Vice-President Mr Theo Markos and Board members Dr Nick Dallas and Mr Spiros Papadopoulos. After a quick tour of the Greek Centre, they discussed a variety of historical and contemporary issues related to both the Aboriginal and Greek communities. Mr Jackomos will present a lecture on the “Greek-Aboriginal connection”, on Thursday 30 November, at the Greek Centre, as part of the celebrations of the 120 years of the Greek Community of Melbourne.